When Captain Charlie and Cathy Simon left St. Lucia in 2014 to sail around the world, they did so with a goal of compiling information to create the ultimate overview guide to circumnavigating the globe under sail. That book, in which the Simons enthusiastically share their wisdom on the life-changing aspects of circumnavigation, is now available. With over 150 photos, 18 maps, 49 aerial diagrams, the QuickStart Circumnavigation Guide is packed with essential and practical information for making the voyage of a lifetime. Chapters with detailed information on ports of call include the Panama Canal, Galapagos, French Polynesia, Niue, Fiji, Vanuatu, Australia, Bali, Indian Ocean, South Africa, Brazil and St. Lucia. 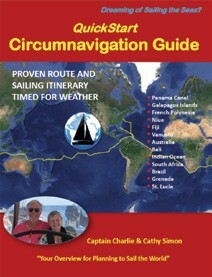 “This is the book we wish we’d had when we began our world circumnavigation,” said Captain Charlie. “The book inspires and prepares others to make the journey that many would consider overly daunting. Sailing the world is not as difficult as you might think.” If you’re dreaming of sailing the seas, QuickStart Circumnavigation Guide is an indispensable resource and it’s available at Amazon and booksellers nationwide. Captain Charlie Simon and his wife Cathy have sailed together for more than 40 years, logging over 100,000 sea miles. They completed a 26,000-mile, 14-month circumnavigation aboard their Taswell 58 Celebrate in 2015, and this year they’re embarking on a circumnavigation of North America including the Northwest Passage. You’ll find more information at WorldSailing.Guru. Captain Charlie’s excellent article, ‘Top 10 Tips for Being Together at Sea,’ appeared in our November/December 2016 issue.